About a month ago, I was asked by my church to prepare a festive Christmas table setting for our women's ministry event. 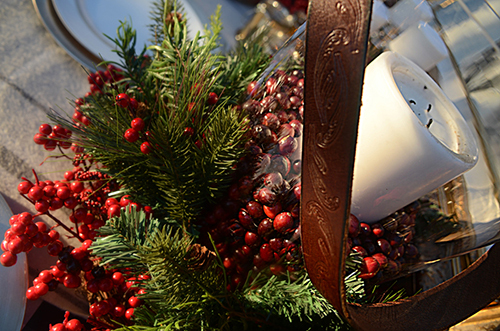 My table would be one of five different decorating styles on display to help women get ideas for how to decorate their home this holiday season. 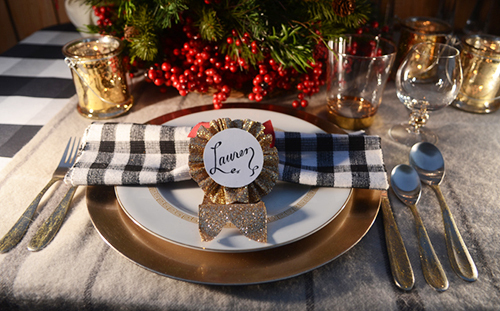 The concept was supposed to be sort of like a living Pinterest party– other tables were filled with Pinterest-inspired appetizers (along with recipe cards), gift-wrapping ideas, etc. 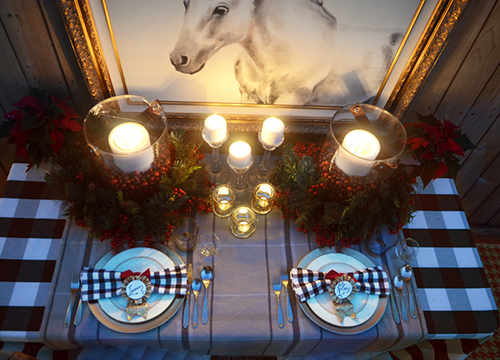 I participated in this event last year (although it had a different format), so the challenge was on to come up with a completely different theme for my table in 2012. 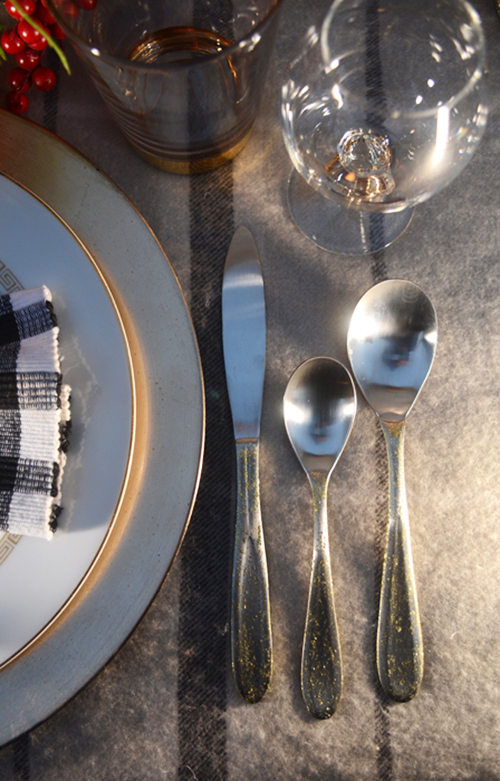 Last year I used my pear collection to do a shimmery green and gold table setting (one of this blog's most popular posts ever). 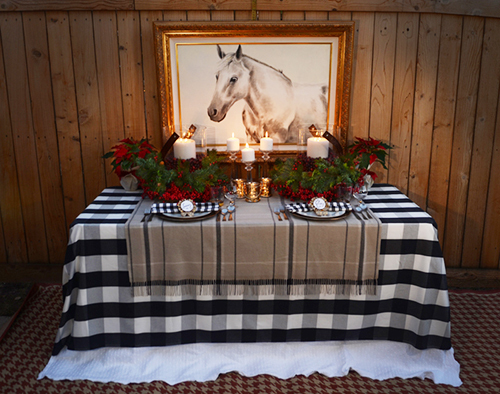 This year I decided to go with a Ralph Lauren/equestrian/traditional table inspired by some images from (where else?) Pinterest! 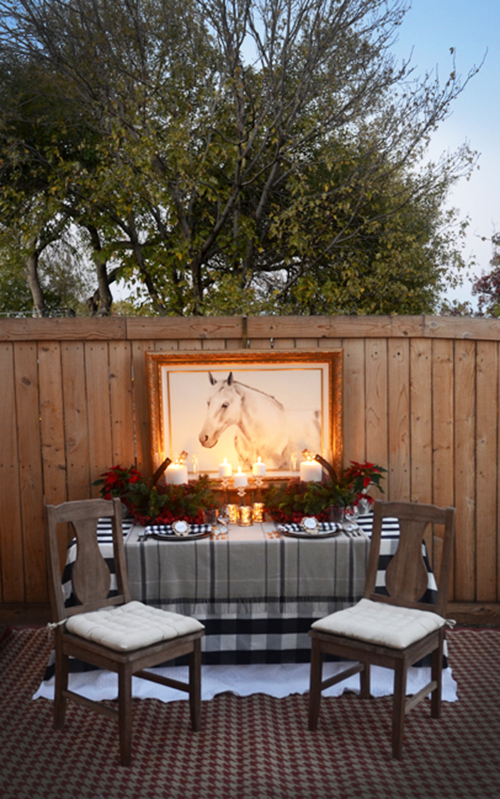 As you can see from my Pinterest board, I was inspired by the equestrian patterns and textiles like tweed, burlap, plaid and leather. 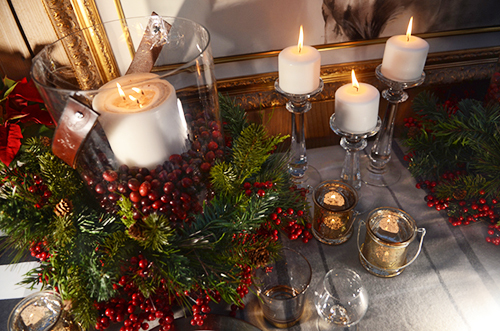 As the sun went down, the candlelight really made everything cozy. 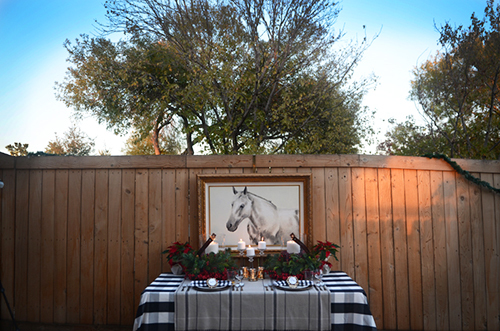 I was talking to my mom on the phone about wanting to do an equestrian theme, and before I know it I was receiving cell phone pictures from her of items in her house that were equestrian-inspired. How about this blanket? How about these napkins? Maybe these hurricane candle holders? My response: "Yes, yes, yes. I would like to borrow all of your stuff!" It got the table off to a good (free!) start. I combined it with all my own stuff (champagne chargers, crystal candlesticks, mercury glass votive holders, and red berry wreaths), and it was coming along. 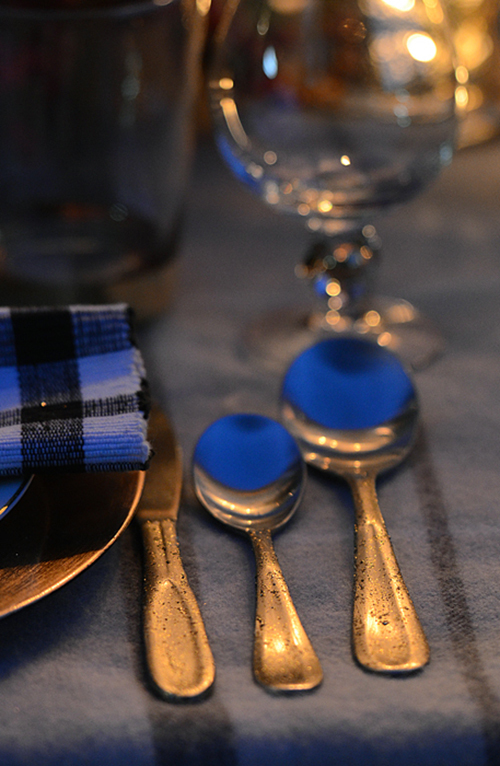 The one element I couldn't really figure out was the tablecloth. What type of pattern did I want there? I needed something graphic that would catch your eye, since the throw blanket I wanted to layer on top was very soft and neutral. Sometimes you like the same patterns on a jacket as you would on a tablecloth! As you can see from the text message, I started doodling right after that. I sketched out a little plan for how that oversized black and white buffalo plaid might look with the existing elements. I liked how it looked in the sketch, so the hunt was on for some buffalo plaid (buffalo check?) fabric. I looked all over the place, but I could not find what I needed. Finally I settled for some fleece fabric from Hobby Lobby. I didn't originally intend to have a fleece tablecloth, but that was the only version I could find locally that had the scale of pattern I wanted. A couple days later, I'm just sitting on Facebook the day before Thanksgiving when a Black Friday advertisement for Ikea comes up. Lo and behold, the ad featured napkins in the exact fabric I was looking for! Of course I took a picture of the ad with my phone. Can you tell I like to document things with my cell phone? Geez. Of course I went straight to the Ikea website to see if I could find the fabric. I was hoping it was just fabric and not actually being sold in napkin size. Luckily for me, they had it! I forced the husband to go to Ikea with me to buy four yards of the black and white Berta Ruta fabric (he's such a good sport). Finally, I had the fabric I wanted all along. That fleece got returned to Hobby Lobby right away. Fabric in hand, the rest of the table came together while my parents were in town over the Thanksgiving holiday. My mom loves decorating as much as me, so of course she wanted to help me try things out. We made the prototype of the glitter prize ribbon place cards (another nod at the equestrian theme) and promptly got glitter everywhere. 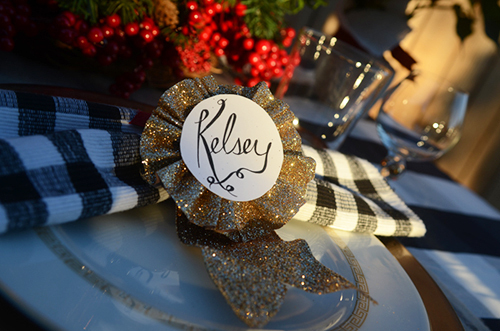 I bought that glittered gold ribbon at Hobby Lobby last year, and wow, does it like to spray glitter around a room! We were banished to the garage for all glittle projects after that. I forgot to take pictures while we were making the ribbons, but I found this helpful DIY Prize Ribbon tutorial for you. I followed this same method using wire ribbon instead of paper. Then I wrote out my guests' names on white cardstock for the center of each place card. 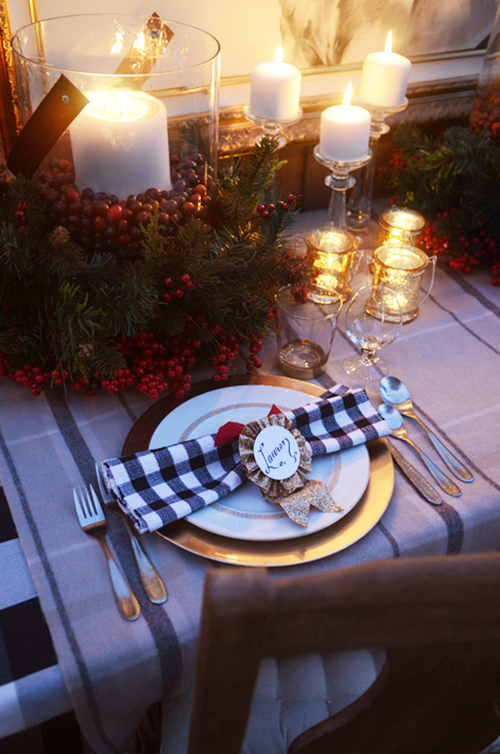 The napkins were simply tied together with ribbon and fluffed into a bow shape, super easy. I don't have any gold flatware, so I decided to make some DIY gold glitter flatware. 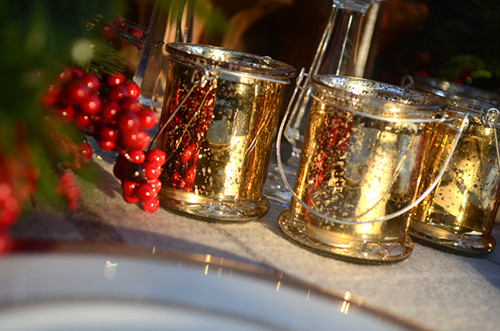 I used glitter craft paint to glam up a cheap set from Ross that I actually bought for last year's tablescapes event. I brushed a couple of coats of Martha Stewart's multi-surface glitter acrylic craft paint (non-toxic) in Florentine Gold onto the handle of each utensil, and then I sealed it with Zinsser Bulls Eye Shellac and Sealer spray paint. The glitter really picked up the candelight and gold touches of the glasses and the plates, so I was really happy with it. I really wanted gold glassware, so I made a run to my favorite thrift store to see if they had any. I was so pumped to find 8 gold-bottom tumblers and 4 brandy glasses (from Crate and Barrel) for only $6. Score! You can see them best in this picture. The brandy glasses have a little golden ball in the base. It's not the first time I've found awesome dishware at that thrift store– I used my thrift store greek key china ($60 for 56 pieces) for this table too! Fast forward another day, which is right about the time when I got in an argument with the husband about cranberries. We've all been there, right? What, you mean I'm the only one who argues with my husband about vase filler? Seems he wasn't too pleased that I went to the grocery store at 11 p.m. on a Monday night and spent $38 on cranberries for those giant glass hurricanes. "I thought you were just going to buy cranberries?" "I did only buy cranberries. But I had to buy 12 bags of cranberries." "What?! How much did that cost?!" I needed every last cranberry, too. Those hurricane are massive! I even put a gallon paint can in the bottom of each one to take up extra space! Alright, this post is long enough. My fingers are tired of typing! If you have any questions, just ask! I'm really impressed if you read this far. Bonus points for you! !